First I have Josephine back from the Sewing machine Hospital. My Honey went to pick him up and when I saw her I said. So now I finished quilting "the Ballerina" and blocked it. It is drying right now. I have 17 patterns out of 18 printed for sale, I have my Square for payments. I need to buy an inflatable bed to put behind my booth because my Narcolepsy will probably require me to take naps. Love that fractured pear! I will have to check out your patterns. I hope the show goes well for you. That pear is amazing and I'm sure many people will want to see your demo. Good luck! I like the fractured pear too! The background fabric is perfect! Love your pear! Have fun at the show! Interesting effect, like the faceted look. This pear is so fun! This is amazing! I love the segments and how much texture and interest there is! Love the use of triangles for the pear, it works so nicely and looks great! Your pear is very cool and I like the stripy fabric you have used as background too. I hope the show goes well for you. 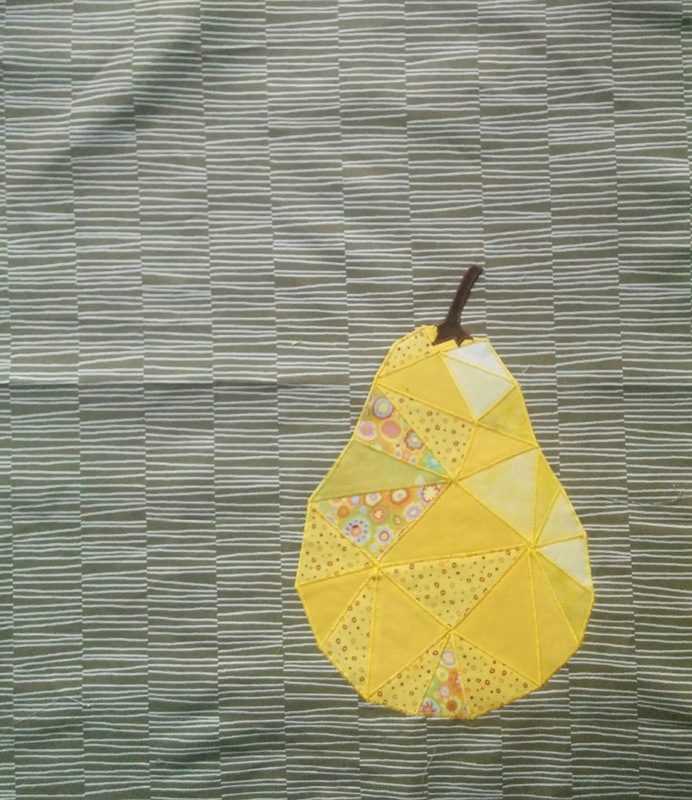 I love this pear, great fabric picks. Fabulous quilt. The fractured pear is especially interesting. Enjoy the quilt show, but remember that you can overdo without even realizing it. Here's hoping you have lots of sales and get to meet all the celebs.